In 2016, Charise and I took a road trip across the American southwest. As is usual on road trips, we covered a lot of miles, saw some amazing things and ate an enormous amount of gas station junk food. Without question though, Antelope Canyon was our favorite stop on the trip. A few years later, it's still one of our best memories. Keep reading to find out what it was like. 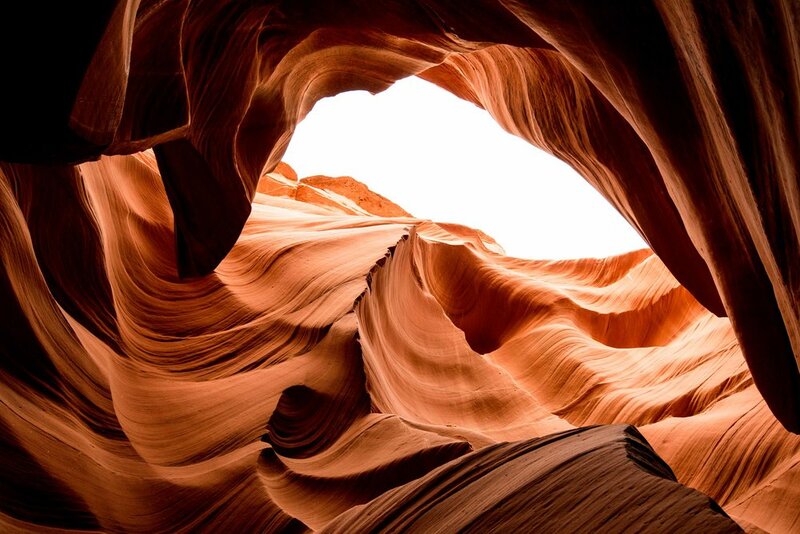 Antelope Canyon is a slot canyon in Paige Arizona. The slots wind and curve through large cracks in the ground. As you walk through, the orange rocks hide fantastic formations and reveal grand open spaces. It's split into two canyons, the upper and the lower. The upper is the most famous because slits in the canyon ceiling create light trails that cut through to the sandy bottom. These light trails are only visible during the summer months at midday though. So since we were in Arizona in November, we chose to visit the lower canyon. The upper canyon is also more accessible because the entrance is at ground level. To enter the lower canyon, you have to descend and climb several steps. Keep that in mind if you have mobility issues. You enter the canyon through cracks in the ground. And down a bunch of steps. Whichever canyon you select, prepare to fight crowds. Even in the offseason, the canyon was packed. You also can't just show up and hike through whenever you want. The canyons are on Navajo land, and the only way to visit is with a tour company. In the town of Paige, several companies will bus you into the area. But a cheaper option is to drive there yourself, park and hire one of the companies on site. We used Ken's Tours, and a regular tour ticket is about 50 dollars including the Navajo Park Permit. 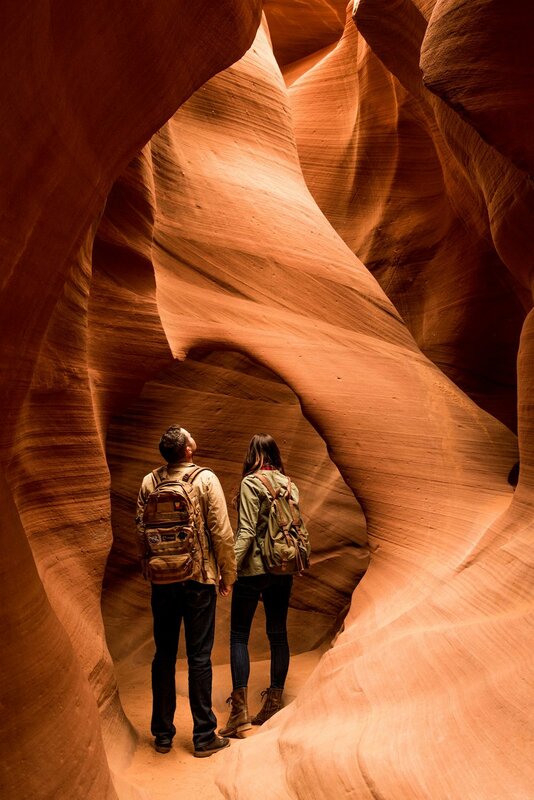 Again, Antelope Canyon is crazy popular. If you can book online, do so well in advance of your visit to assure you'll have a ticket. One thing we did to avoid the swarms of people, was pay extra for the "photographers tour." 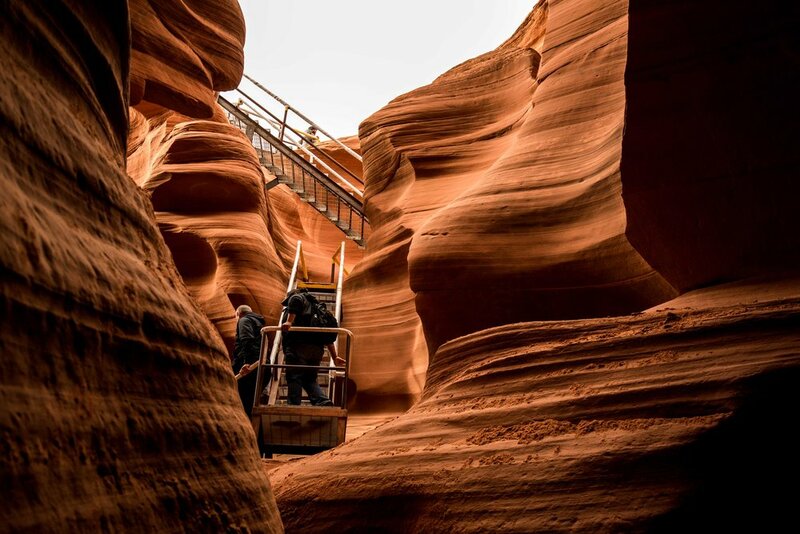 Antelope Canyon is one of the most photographed spots in the world and everyone there is trying to get a great shot. During the tour, visitors are crammed into the canyon, blocking you from getting a clean view. If you're on the photography tour, however, you get special treatment. The guides clear the way and give you more time in each spot of the canyon. If we had been on the regular tour, there's no way we could have gotten the pictures we did. They are pretty strict though about who is considered a photographer. You can't just show up with your phone and expect to go on this tour. They required both of us to have a DSLR or Mirrorless camera and a tripod. In researching this post, we found out that the photography tours are restricted to only certain times of year now. But the tour companies do offer more deluxe tours year-round. We would recommend getting in on the smallest tour group you can for the best experience. Despite the challenges and crowds, Antelope Canyon is a spectacular place. It would be great if you could hike there and have the place to yourself, but that's just not possible. The people can be overwhelming in the high season, so definitely spring for the more private tours if you can. We had a great time there and can't wait to visit again. 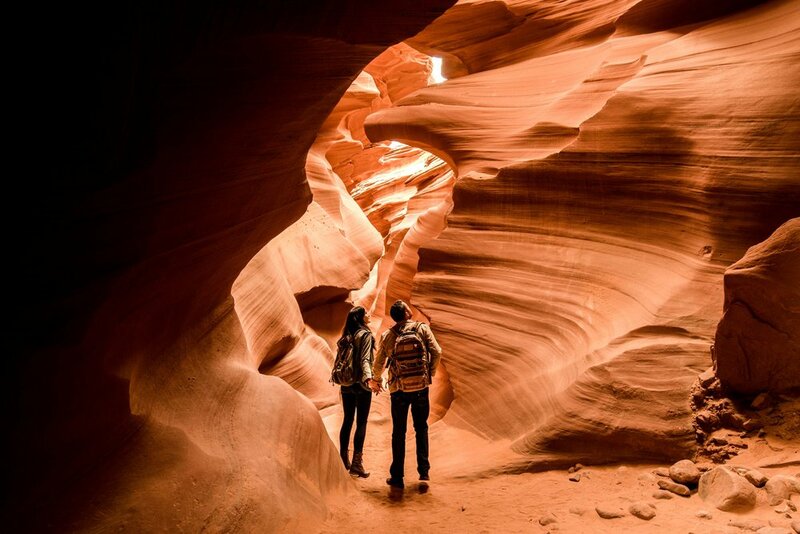 Have you ever been to Antelope Canyon? How was it? If you haven't been, has this article inspired you to go? Answer below in the comments.